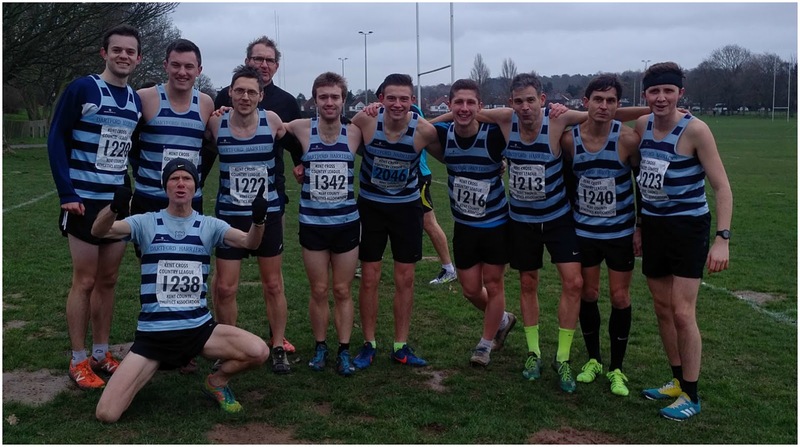 The final fixture of the 2017/18 Kent Cross Country League took place at Sparrows Den, West Wickham. Sparrows Den Playing Fields is simply an area of open grassland which is laid out with sports fields, with rugby being the main sport. Although the official name of the race is 'Sparrows Den', it is only the race HQ, toilets and the start/finish area that actually uses this area. Technically the race itself is almost entirely (96%) run in the adjacent area of Spring Park. Only the first and last 200 metres are run within the Sparrows Den area. Spring Park consists of open grass areas which are contiguous to the Sparrows Den playing fields and a large wooded area. Car parking for this race is possible in a number of local car parks or on Woodland Way which is the road behind the woods. The course is made up of the start/finish straight in Sparrows Den and then the description gets a little weird. The official description of the men's race is as as follows; 1 lap of the field, 1 lap of the woods, 1 lap of the field, 1 lap of the woods, 1 lap of the field, 1 lap of the woods, 1 lap of the field, and lastly onto the finish straight and you're done. The majority of the course is largely flat, but there are two hills to climb as you head in a north-west direction through the woods, and although not terribly long, they are quite steep and bloody hard work. My favourite section of the course is the meandering single track path that runs along the southern border of the wooded area. Despite having some stomach pain (possibly a stitch) during the middle of the race, I had a reasonable run and finished pretty much where I would expect to finish. It's a great cross-country course which is certainly very suitable for cross-country spikes. I finished in 125th position in an official time of 47.21.